Our travel from Jinja to Fort Portal started off too easily. We showed up at the taxi park, jumped on a bus with posted prices and left quickly. Then Africa remembered that travel isn't supposed to be easy. Arriving in Kampala, Uganda's capital, we walked through the old taxi park. This is one of the most chaotic scenes on earth, hundreds of mini vans packed so tightly together that Tom had to carry his backpack above his head to get through. Eventually we wound our way to the new taxi park and were shown to a bus apparently bound for Fort Portal. We proceeded to sit on this bus, without moving, for three hours. Mads spent the time being stared at, grabbed through the windows and receiving marriage proposals. It was rather uncomfortable. Eventually we departed and crawled through Kampala's overcrowded streets. After five hours on this stop-start bus we were ushered off and told that we had to get onto a matatu (minivan) for the remaining 50 kilometers. We were supremely pissed off at not having been told this from the start, and more so at sitting about for another half hour while the driver argued with various people for no reason. Eventually we rolled on, with the driver trying to substitute his hazard lights from headlamps. Fun. Arriving late in Fort Portal, we found cheap accommodation with rather nasty ablutions, but took them anyway. 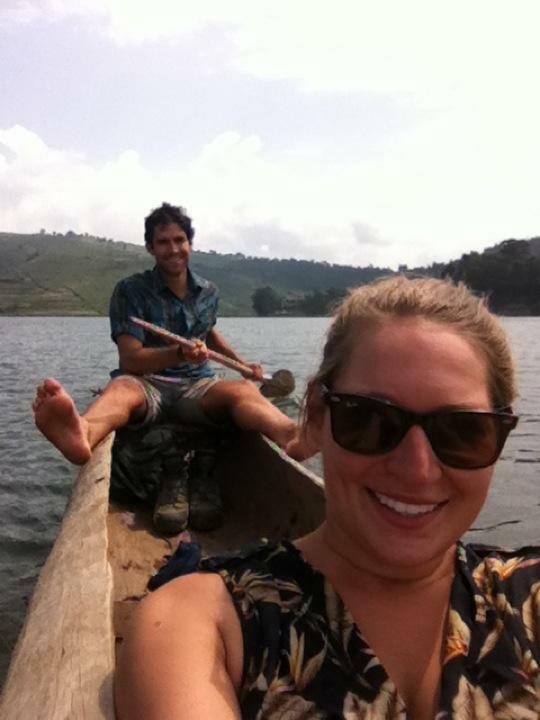 We had intended to go out and see the crater lakes, our reason for visiting this part of western Uganda. We woke up to the sound of pouring rain however, and decided we would sleep in instead and stay an extra day in town. Long story short, we ended up staying three days because of the weather and the fact no buses run on Saturdays. We did get out and see Lake Nkaruba, and while it was lovely and peaceful, it probably wasn't worth the effort involved in getting to and from Fort Portal. The highlight was probably a night at the Gluepot restaurant, eating wood fired pizzas with real mozzarella! Next destination was Kabale, and after swearing off overnight buses following the Nairobi-Jinja transport, we somehow found ourselves on another one. This bus showed up the requisite hour and a half late, and was already overflowing. Someone graciously offered us his seat, then requested some money for it. We declined him. This bus was hell. East Africans are not what you would call regular with their showering habits and do not understand the concept of deodorant. Along with absolutely reeking, this bus was carrying about twenty-five people too many and stopped very frequently. We got held up for a while stuck behind a convoy of UN tanks bound for the DRC border and there was also an incident with a loose, flapping chicken, and anyone who knows about Mads' phobia of birds will recognize why this would've been very little fun. We arrived in Kabale at 5:30 in the morning, completing what has been the worst bus of the trip so far. We sat in the bus office, which was full of bags of chicken feed until it became light and then went and found accommodation. We decided that, despite not having slept all night, we would load up on caffeine and head straight out to Lake Bunyoni, the reason we were in Kabale. Renting a dugout canoe, we paddled off into the lake's islands, though eventually we gave up as it was too much work, lay back in the sun and let ourselves drift. Unfortunately we drifted directly away from our landing, and getting back became rather frustrating, as these canoes are not particularly easy to steer. Mads became increasingly frustrated, swearing like the seaman she presently was, while Tom just laughed, not helping at all. Eventually we made it to shore and decided we were much better at overland than sea travel. Dinner that night was local crayfish from the lake, one of the nicer meals in Uganda. The next morning we caught a ride on the Post Bus, which goes from town to town delivering and picking up mail. It actually left within ten minutes of advertised time, an African miracle. We got back to Kampala and hopped a matatu to Entebbe, on the shores of Lake Victoria. Setting up the tent at a hostel, we went looking for food, giving up after finding nothing decent at a reasonable price and eating at the backpackers. The following morning we rolled up our gear, caught a boda boda a few kilometers to the Ugandan Wildlife Education Centre, our final Ugandan stop. We again went unsuccessfully looking for food, eating a lunch consisting of our dietary staple, chips, before walking around the centre. This place looked a little like a zoo, but all the animals have been rescued from poachers, making it seem a very worthwhile cause. Viewing white rhinos up close (less than ten metres away) was pretty special, but the highlight was the resident leopard. Initially it was sleeping in a tree roost, but when it noticed us watching it, it jumped down and started prowling the fence. It eventually settled about a foot inside the wire, allowing us to take photos from such a close distance that we were slightly worried about the big cat having a rush us, especially when Mads had her hands inside the cage in order to get unimpeded photos. This was a truly amazing experience, as we were interacting, two on one, with the leopard. After an awestruck half hour, we wandered off, giddy from the event. That evening we headed to Entebbe Beer Belt, and spent the night contributing to our own beer spare tyres, eating fantastic chicken off the street grills for dinner. Stumbling home at midnight, we woke up the security guard who marched out, with his large rifle in hand, to let us into the centre. Our final Ugandan blog sees us sitting at Entebbe airport, waiting for a flight to Ethiopia. While we still have weeks to travel, this feels a bit like the beginning of the end. South and East Africa has been frustrating, difficult travel, with very few culinary delights and constant rip offs, or mzungu tax, as we refer to it. Nonetheless the sights, from Kilimanjaro's peak to Fish River Canyon's winding depths, have been absolutely spectacular, and we are sad to leave.